If you’re lucky enough to have your desk near an open window or (better yet) on a sunny patio, good for you! If, however, you work all day in a space with no access to greenery and fresh air, well, less good for you. But take heart: research from Texas A&M University, Surrey University in England, and Washington State University all point to the measurable benefits of including live plants in your office decor. Happy people are productive people. It turns out we respond well to plants even at an unconscious level. Research shows that greenery in the workplace results in lower stress, higher creativity, and better problem solving. Productivity can improve by as much as 15%, and people report better concentration and greater job satisfaction when their office includes foliage. Plants are quiet. 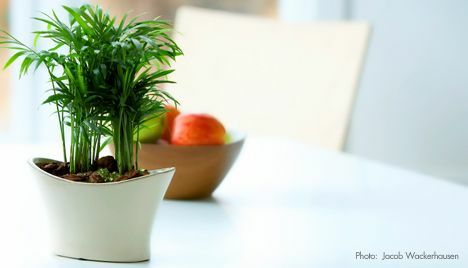 When strategically places, plants can actually reduce office noise by 5 decibels. They act as natural sound absorbers, cutting down on distracting noise pollution and helping you stay focused. Better than ‘an apple a day.’ In an enclosed office, any toxins emitted by materials in the building just get recirculated through the sealed system. Enter your leafy friends: Plants absorb chemicals from the air and transmit them to their root systems where they’re converted into usable nutrients. As a result, plant-filled rooms contain 50-60% fewer airborne molds and bacteria than rooms without plants. Read more about the whys and hows of incorporating green into your office space here, and consider Source’s Greenguard certified products for a healthier, low-emission interior. Source Office Furnishings — Making Your Office Work Better!